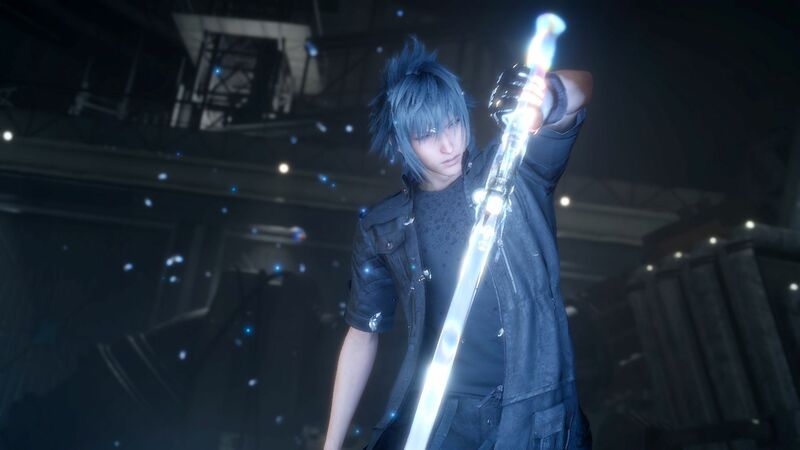 It’s been a long 10 years since the original Final Fantasy Versus XIII was announced, and the Final Fantasy XV we’ve been presented with is a long ways from what we saw all those years ago. Was 10 years of development good or bad for the fifteenth installment in this long running series? Final Fantasy XV follows the story of Prince Noctis, heir to the throne of Lucis, and his friends – Ignis, Gladiolus (Gladio), and Prompto – as they work to help Noctis reclaim his throne following the passing of his father, King Regis. In order for him to reclaim his throne, he and his friends will need to road trip across the continent to find the secrets to his heritage. Somewhere along the way they’ll meet bad guys (who may or may not be part of the empire), fight giant eidolon/primals/espers, and ride a car and train. A lot. If I made you get lost near the end of the sentence, then you have successfully understood the direction Final Fantasy XV’s story goes in. Well, I shouldn’t really say the story goes in the direction – it sort of starts there and never comes back to the land of “okay, this makes sense and I’m getting into this”. The introduction to the game is one of the worst I’ve ever seen in Final Fantasy; you get some thrown together footage of the four guys in some big, fiery battle which is then proceeded by ever exciting pushing of a broken down car. You’re then set in charge of going around fetching a bunch of money while your car – the Regalia – gets repaired. In a lot of ways, Final Fantasy XV plays a lot like a reverse Final Fantasy XIII; the game starts out open (in other words, it starts out on Pulse) and ends with the super linear part (ends with Cocoon). The thing is, I felt that Final Fantasy XIII actually made the story make sense. Final Fantasy XV’s story is filled with more holes than swiss cheese, and it’s come to my attention just before I sat down to write this that they’ll actually be going back to patch in more story. After 10 years of waiting this just feels like a gigantic slap in the face. During one of the pre-release patches, new cutscenes were added into the game. These cutscenes, just a handful overall, are from the Kingsglaive movie and the Omen trailer. None of this content felt natural in the game, and in one very early instance, it aided in hurting the tension of the following scene. Ironically, the way it aided in killing the tension is one of the few instances of us actually seeing some backstory instead of just a hole. It would have been much better if they had just scooted the scene slightly later to after we had the reveal of what happened to King Regis. The other major issue with these new scenes is that they simply use some generic music instead of something that is actually fitting for what is going on. Character development, much like the story, is a giant hole filled mess. As you progress through the game so many character names are thrown at you and you are given very little reason to care if something happens to them, or about who they are. 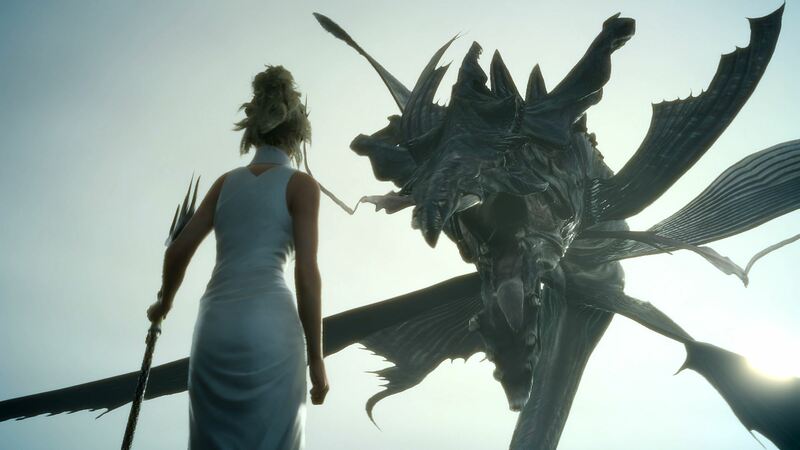 One of the largest offenders in this regard is the main heroine, Lunafreya. She is billed as the main heroine, and yet we hardly ever see her and are given very little reason to actually care about her character. Whenever she came on screen I just couldn’t bring myself to care about her as I knew she would be gone again shortly. Noctis and the boys also get more depressed about the happenings to a random NPC that I couldn’t even remember who they were than when the King – Noctis’s father – died. With that said, the general character development of the main four is better than the rest, but there are still certain events there that happen offscreen and we end up with very little reason to care about them. Unlike the story, area design is mostly top notch. During the open world sections you have a lot to explore, and I mean a lot. While unfortunately a good chunk of this area to explore feels actually unnecessary and simply empty, there are certain special enemies you can find out and about that will really challenge you. This was actually one of my favorite aspects of FFXV; I absolutely loved going out and finding random level 58 special enemies that I could try and fight to take down. Sadly the game does also like to dump enemies on you, and there can even be instances where you are fighting said level 58 enemy and you get a nice, “friendly” level 76 magitek armor dropped on your head. That was an element I didn’t enjoy so much. The game also mostly nails dungeon design. You, for the most part, don’t feel like you are in a dungeon for too long, yet you feel like there’s a lot to see and do in said dungeons. This falls apart badly during Chapter 13 in which you are stuck in a dungeon for about 95% of that chapter and it just feels dull. The whole sequence takes entirely too long, you’re stuck staring at the same walls and the same enemies for most of it, and it just wasn’t fun. Perhaps if the entire sequence had just been cut in half in terms of how long it took it would have been better. One of the largest glaring flaws within Final Fantasy XV – after you look over the story that is – is the camera. The camera is absolutely horrendous, and there are even some battle sequences that make the camera even worse than it already is. During one particular battle sequence in Chapter 9 the camera got so horrendously bad that I actually had to step away from the game for over 20 minutes once I had beat it just to stop feeling so horribly sick to my stomach. The camera does not do a good job with properly following high action sequence, and it does even worse when you’re stuck in tight spaces. More than once the game would decide I wanted my camera stuck up close to me after finishing a dungeon despite having it set to be far away from Noctis. Speaking of combat, it’s about high time I mention this. A lot of the combat is simply mashing X to attack the nearest target. There is a lock on system but you’ll be fighting it more than it helps you. In order to lock onto a target you will need to press and hold R1, but when that target dies the game won’t automatically switch your lock on to a new target. Instead you’ll need to let go, find the next target, and THEN press R1 once more. Considering mechanics such as Warp Strike rely on you being locked onto your target, it becomes a lot more of a hassle than it really should be. You can change between one of four different currently equipped weapons at any time, altering your attacking type. Every enemy has a particular weakness, although I found I could just stick to one or two weapon types for almost the entire game and I was fine. As long as I was paying attention to flans and not hitting them with a weapon that was causing green numbers to appear – something that is a bit hard to keep track of in the heat of battle, and could be a HUGE issue for color blind folks – then I would get through most battles without much problem. Well, I did have to item spam when I was up against the enemies many levels higher than me, and bosses hit for far more than they really should have, but in general the combat was fairly easy. 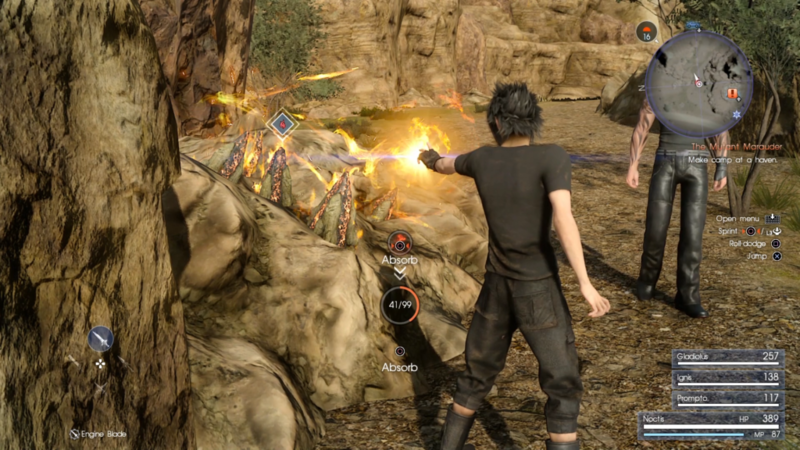 Warp Striking is a system that will allow Noctis to quickly zip across the field toward an enemy to deal a higher amount of damage to them at the cost of some of his MP. 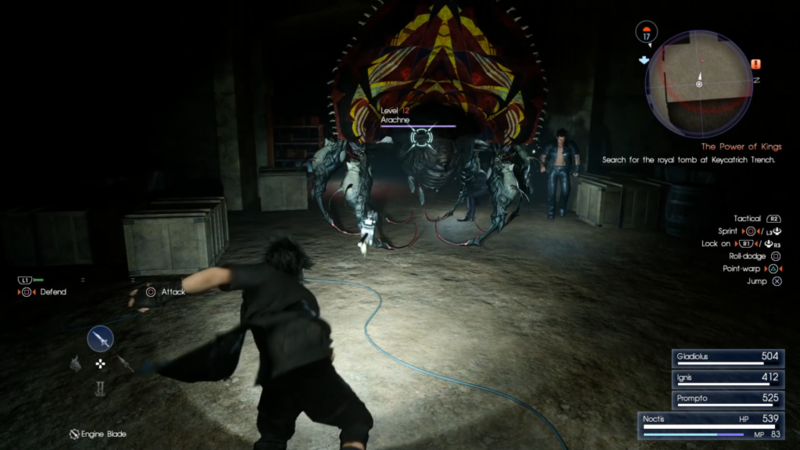 Should you run out of MP, Noctis will enter a Stasis mode in which he can no longer warp strike around. The fastest way to get out of this is to find a nearby ledge, rock, etc that you can warp over to, instantly recovering his MP. MP will recover over time, but the fastest way to do so is by warping to one of those places. I really did enjoy the warp strike system, although it would have been a lot better if the lock on system was better. Take note that being able to dodge enemy attacks with good timing will also consume your MP, and that not all areas will have somewhere you can warp to to recover your MP. Magic in FFXV goes back to the basics. You are simply given your main three elements – Fire, Blizzard, and Lightning – that you’ll need to draw from nodes near campsites. Once drawn, this magic cannot be used until you combine it together to make actual magic. Do note that you can only hold up to 99 of an element at once, so you may find yourself frequently going in to make some more magic. The good news is is that magic is actually extremely powerful in FFXV. Not only that, but you can combine items into the mix as you’re making the magic to give it additional effects such as healing properties, status ailments, and even additional experience gain. If you want to be able to hold on to more magic though you will need to be on the hunt for “Magic Flask” items so that you gain more slots and don’t have to throw away already made magic to get more. The AI of the other three guys is hit and miss – you’ll find that Noctis does the majority of the damage, but you can feel it when they aren’t there to help. Prompto has an issue of constantly running in to die to everything, and in several situations I would liken the AI to Donald in the Kingdom Hearts series. They’re never useful when you want them to be, and they’ll do things you don’t want them to do. Thankfully you CAN control Noctis well and actually make battles not be super painful to do. Final Fantasy XV runs on a day/night cycle that is supposed to be a huge plot point in the game, but the actual mechanic in the game stays static instead of fluctuating like it should be. During the day, everything is all safe and sound, but come night the scary daemons come out to play. Ignis will often suggest you rest during the night hours as it “isn’t safe”, and this becomes your prime time to want to go back to level up. 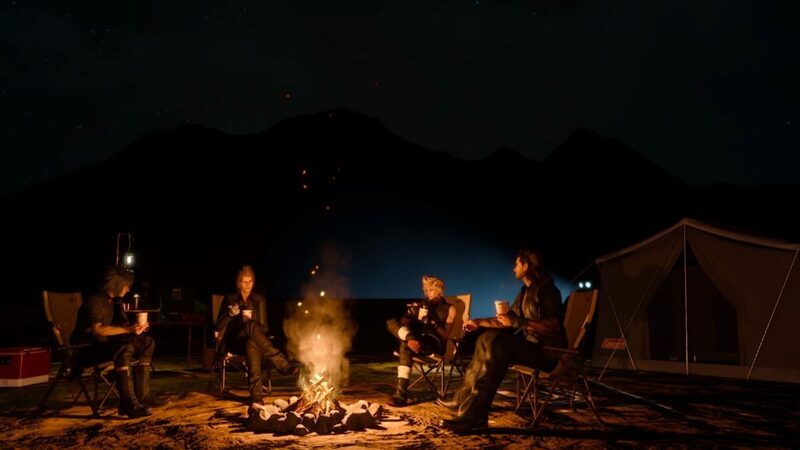 The only way you are able to level up in FFXV is by resting at either a campsite or at an inn. There are benefits to each, and it all depends on what you want to do that night. Want to get yourself a meal alongside your resting? You’ll want to go to a campsite. Want an experience bonus? You’ll need to head to an inn. As you play through the game, you’ll find that each of the guys has a particular skill that the are good at. Noctis enjoys going to relax with some fishing, Gladio wants to help everyone survive, Ignis keeps the party fed, and Prompto is all about his pictures. These skills will only level up when you go to rest (whether it’s at a campsite or inn), and in the long run aren’t super necessary for progression. Well, food can be extremely handy but it will be erased should you rest again (or it wears off), and Gladio can get some handy items for either use in battle or for magic making, but fishing and photography aren’t as needed. With all that said, fishing turned out to be one of my favorite things to do in the game. While at first fishing is a bit confusing – it can be hard to determine how you’re actually supposed to hook a fish – once you get the hang of it it turns into something extremely addicting. The only thing that would make it better is if I didn’t have to hear “Talk about backseat fishing.” every other cast. Once I started to really figure out the key – not reeling while the fish is splashing around and how to best hook the fish – I would have to drag myself away from the ponds to go do other activities… which may or may not have often involved going to find another fishing spot. The main annoyance I have with it is that if your line snaps you will lose your lure, something that can get even more annoying on the more expensive/harder to find lures. I also enjoyed the photography, but not to the same extent as fishing. Each time you rest you’ll be able to go through the photos that Prompto took during the day(s) and save which ever ones you like best. I do wish that the photos did not come attached with a gigantic border around them and that they actually filled my TV screen though, as it makes it harder to want to justify saving them to my PS4’s harddrive to look through later. 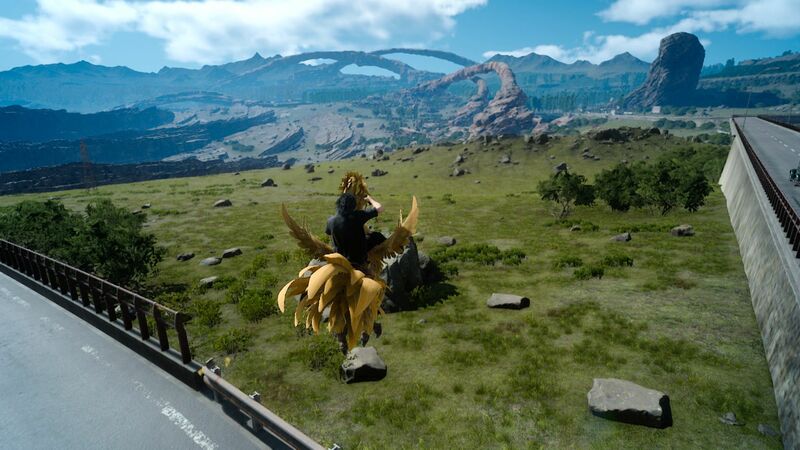 Graphically, Final Fantasy XV is gorgeous… for the most part. There are some really ugly moments if you look at the NPC models, and you can tell the main budget went into making sure the hair of the guys moved just right in the wind. Even Cindy’s model is extremely static, despite the obvious emphasis on her breasts… that don’t move and just stay still. The previously mentioned scenes out of Kingsglaive and Omen also clash heavily with the regular art direction of the game, adding to their out-of-place feeling. Audio wise, the music is amazing… if you ignore what is going on in the added Kingsglaive and Omen cutscenes. It is a bit disappointing that two of the songs released as promotional material (among many other missing things) weren’t actually included in the game. On top of all this, the game is riddled with a lot of random bugs. While none have been extremely game breaking, I came across a few during my time playing and saw a huge number posted through social media outlets. The glitches I found included seeing Prompto with his offhand weapon all the way through his body during a cutscene, a man with a beard that would appear/disappear depending on how you moved the camera, and a monster that got stuck on terrain. I have seen a few more extreme ones though, such as the game completely crashing when it failed to load Noctis during the cutscene for refueling the car. In the end, it’s a bit of a sad state of affairs for a game that took 10 years, a rename, and a new development team to come out. The story is a hole filled mess instead of the complete story we’ve come to expect out of Final Fantasy titles (yes, even Final Fantasy XIII). The AI sometimes makes Donald look good. There’s numerous bugs and glitches everywhere. Thankfully, exploring around the open world is enjoyable, although it can get old after awhile, and fishing is a nice time killer. It can also be nice to go in and challenge yourself against high level enemies or to explore into the secret dungeons and find what horrors await you in there. Sadly, one of the biggest appeals to me in a Final Fantasy title is the story and this game just dropped the ball. The final nail in the coffin was the previously mentioned Chapter 9 sequence that made me extremely sick to my stomach. I really wish I could recommend the game but I feel like there are too many story and camera related issues to justify doing so. Can we have our looping title screen back, instead of simply “A Final Fantasy for Fans and First Timers” as well? Final Fantasy XV is available now for PS4 and XBox One. I would like to thank Square Enix for providing me with a PS4 code of the game for review.